On meeting Amar Doulatani, it’s quite difficult to differentiate between a teacher and a trader, a social worker and a leader, a business man and a literary person, a strict organizer and a relaxed music lover, an avid reader and a writer. The personality of this 73 year old senior citizen is as diverse as the land of this great country, and you would be convinced that you have come across very few people like Mr. Doulatani. To sum up he is perfection personified. Originally from a powerful and prosperous family of undivided Indian province of Sind, the Doulatanis have suffered a lot during the partition and independence in 1947. After adopting Gujarat as their native in new India, they have regained their lost pride and, of course, prosperity. The Doulatani family is in hospitality business in and around Ahmedabad with the head of the family Mr. Amar Doulatani being active in several fields apart from his business interests related to estate property and share investments. Two of his sons and a grandson are currently managing the Hospitality business. There were financial problems because the family had left everything behind during the partition and had migrated to Gujarat land with empty hands. Amar, at the tender age of 12 years, along with his studies started helping his father in cloth business. After passing 11th grade in 1959, he started his career as a typist in an engineering company with a monthly salary of just Rs.100, but soon, he became a teacher in a school. After graduation, with scholarship he cleared his Master of Arts degree in the year 1966. Though he wanted to pursue a Doctorate in literature thereafter, he could not do so taking into account the family needs, and as well as, on his father's insistence. Amar says, “My father knew that without education man is blind. Being uneducated himself this thought always pinched his heart.” After his father’s death in 1996, Amar transferred his seventeen rooms bungalow with land area of 1350 sq. yard in a developed area of the city for education purpose to a Gujarati registered charitable trust at a very low price to fulfill his fathers wish. He did put a condition that the trust will utilize the property to give education to needy and poor students only. Later on, Mr. Doulatani formed his own family charitable Trust named "Faith Foundation". 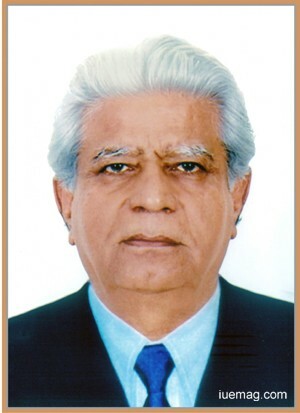 Mr. Doulatani started his career of textile trading, and subsequently, became the Secretary of reputed Sindhi cloth Merchants Association in Ahmedabad. Over the years, he also ventured successfully into other fields of business. He strongly believes, "There is difference between interest and commitment; when you are interested in doing something you do it only when it is convenient but when you are committed you accept no excuses but only results". He has always been a person of experiences and that defines his life. Working in different fields like wholesale textile trading, Estate and Property Development Projects and Hotel business, etc, he has lived his life through phases and seen things enter and leave life. But today, he feels grateful for all he has gained and for everything that life has taught him. Even today, he is ready to learn new things and doesn’t find himself old for anything. Any facts, figures or references stated here are made by the author & don't reflect the endorsement of iU at all times unless otherwise drafted by official staff at iU. This article was first published here on 15th November 2014.